Encompassing five insurance brands and an asset management company, Netherlands-based VIVAT is committed to delivering cutting-edge financial services. To get an edge on their competitors, VIVAT decided to look for efficiency opportunities inwards – starting with IT. 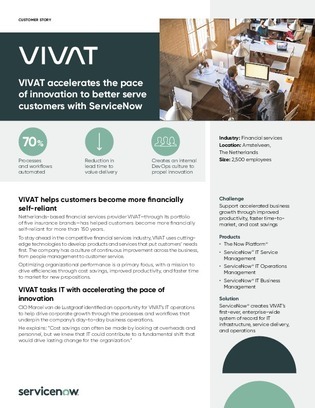 In this case study, find out how VIVAT reimagined its IT service management strategy to better support over 2,500 employees – ultimately introducing an enterprise-wide system of record for IT, service delivery, operations, and development teams.